Ages 5-12. 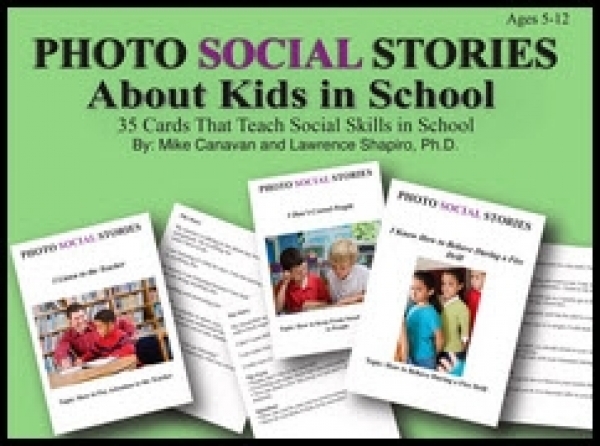 Based on a widely accepted technique developed by Carol Grey, each card presents a basic social concept that children need to learn to behave appropriately in school and get along with their peers. The stories help children pay attention to important social cues, to understand the perspective of others, and to respond appropriately in social situations. This set of 35 cards includes topics like listening to the teacher, obeying class rules, following directions, giving compliments, asking permission, apologizing, keeping things organized, and many more. Each story is followed by bulleted highlights and a set of interactive questions to stimulate discussion. The photographs on each card were selected to provide children with a visual understanding of the social challenges in school.